Background Spondyloarthritis (SpA) is a slowly progressing, chronic inflammatory disease predominately affecting the axial skeleton. It is caracterized by excessive extracellular matrix (ECM) remodeling of the affected tissues. It is proposed that serological biomarkers of ECM remodeling can be used in assessment of SpA progression, diagnosis and treatment efficacy. Objectives In this study we investigated the turnover of selected ECM proteins in a β-glucan triggered SpA SKG mouse model. Turnover of type I, II, III and V collagen were evaluated in serum by biomarkers reflecting MMP-derived degradation fragments of the collagens (C1M, C2M, C3M and C5M, respectively). Methods Fifty SKG mice were included in the study for the SpA model. Additionally ten BALB/c mice were included as a reference of regular healthy mice. The BALB/c mice and ten SKG mice were sacrificed at week 0. 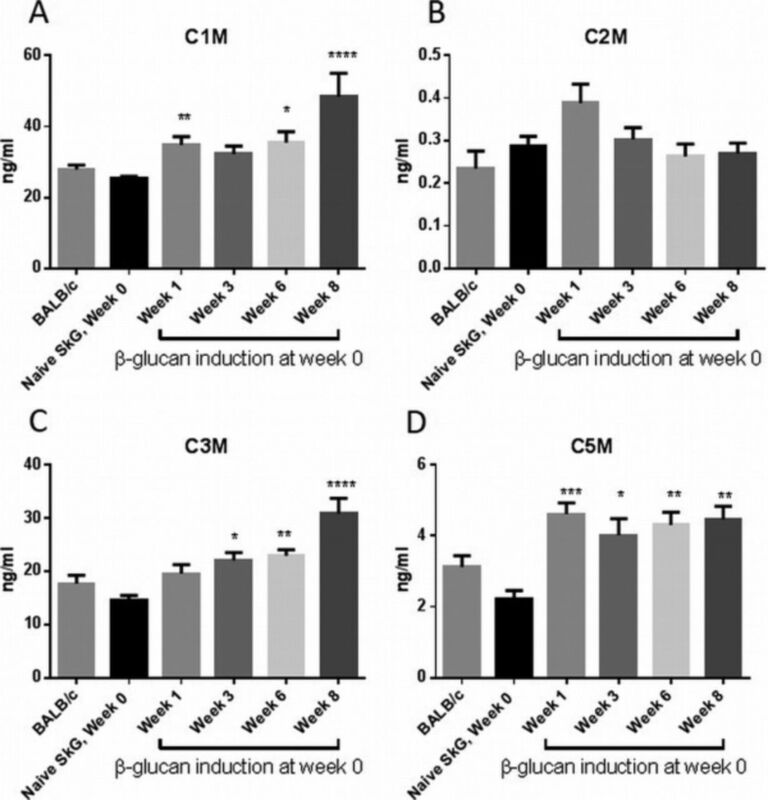 The remaining SKG mice (n=40) were induced with 3 mg/kg β-glucan at week 0. 10 animals were sacrificed each at week 1, 3, 6 and 8. All groups were observationally scored weekly for the development of arthritis and skin inflammation, and body weight. Blood was collected via cardiac puncture at termination. The biomarkers (C1M, C2M, C3M and C5M) were assessed by competitive ELISAs in serum. Differences between biomarker levels in Naive SKG mice compared to other groups were evaluated by Kruskal-Wallis multiple comparison test. Results Clinical scoring revealed that the disease progressed throughout the study, starting with mild manifestations at week 1 in the β-glucan induced SKG mice. The biomarkers of interstitial tissue C1M, C3M and C5M were in general elevated compared to naïve SKG mice (Fig. A, C, D). The C5M levels were increased from an average of 2.2ng/ml to 4.6ng/ml already one week after β-glucan induction (p<0.001) and the levels remained elevated in all β-glucan induced mice compared to SKG naïve mice throughout the study (Fig. D). C1M was significantly increased from an average of 25.6ng/ml to 34.7ng/ml at week 1. This level was further increased at week 8 of which the average level was 48.5ng/ml (p<0.0001; Fig. A). C3M levels were significantly increased from an average of 14.6ng/ml in SKG naïve mice to 22.7ng/ml three weeks after β-glucan induction (p<0.01) and they were further increased to an average of 30.9ng/ml after eight weeks (p<0.0001; Fig. C)). In contrast cartilage turnover reflected by C2M (Fig. B) did not change significantly after β-glucan induction at any time point. There were no significant differences between biomarker levels of BALB/c mice compared to the SKG naïve mice. Conclusions The turnover of type I, III and V was significantly altered in this mouse model of SpA. This indicates an unbalanced turnover of the interstitial tissue. Levels of C1M and C5M were significantly increased already at week 1 after β-glucan induction, while symptoms were still weak. This suggests that C1M and C5M may be useful to assist early diagnosing. In contrast levels of C2M reflecting cartilage degradation were unaltered upon β-glucan induction, suggesting that cartilage turnover was not significantly affected in this model.